A catchy PSA about making bigger choices when it comes to weed -- the first produced spot Inspired by our teen workshops. Selected teens from our workshops participated in a series of roundtable discussions about the role of marijuana in their lives and the importance of making "bigger choices." A girls-only roundtable about the effects of marijuana within families and how to stay focused on "bigger choices." Our second PSA about making smart decisions when it comes to marijuana. The second rap spot about making bigger choices when it comes to weed. Dr. Drew Pinsky, KROQ's Psycho Mike and AMP Radio's Edgar Sotelo answer teens questions about weed. In response to Prop 64, Fraser Communications and the Los Angeles County Department of Public Health (LACDPH) contracted me to design and conduct a series of youth messaging workshops to generate strong peer-to-peer marijuana messaging for LA's under-21 population. Using material from the workshops, I wrote and produced the copy, music, and video content for LACDPH's $2 million "Let's Talk Cannabis" campaign, including the widely-aired "There Are #BiggerChoices Than Weed" spots, with Creative Director Bruce Dundore, that is expected to generate 30 million impressions. 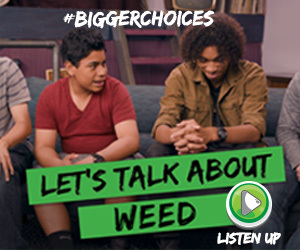 Using a variety of mediums commonly used by teens, this innovative, digital and social media-based public education campaign includes a series of videos, including rap music videos, roundtable talks, and influencers to provide accurate information from trusted sources and peers about the dangers of using marijuana before the legal age of 21. Another component of the campaign, which launched last month, is a video series featuring addiction specialist and local media celebrity, Dr. Drew Pinksy. These sessions are currently available via Entercom radio stations, including KROQ, and can be found at: https://kroq.radio.com/teen-cannabis. In addition, iHeart Media has partnered with Public Health to host teen roundtables led by iHeart teen celebrities Savannah and DJ Young One. The public education campaign is expected to generate more than 30 million impressions.